• Sensitive and accurate. Use as little as 20 μL samples. Detection range 0.3 g/dL (45 mM) to 5 g/dL (750 mM) albumin in 96-well plate assay. Albumin is the most abundant plasma protein in human. It accounts for about 60% of the total serum protein. Albumin plays important physiological roles, including maintenance of colloid osmotic pressure, binding of key substances such as long-chain fatty acids, bile acids, bilirubin, haematin, calcium, magnesium. It has anti-oxidant and anticoagulant effects, and also acts as a carrier for nutritional factors and drugs, as an effective plasma pH buffer. Serum albumin is a reliable prognostic indicator for morbidity and mortality, liver disease, nephritic syndrome, malnutrition and protein-losing enteropathies. High levels are associated with dehydration. Simple, direct and automation-ready procedures for measuring albumin concentration in biological samples are becoming popular in Research and Drug Discovery. BioAssay Systems’ BCP albumin assay kit is designed to measure albumin directly in biological samples without any pretreatment. The improved method utilizes bromcresol purple that forms a colored complex specifically with albumin. The intensity of the color, measured at 610nm, is directly proportional to the albumin concentration in the sample. The optimized formulation substantially reduces interference by substances in the raw samples. 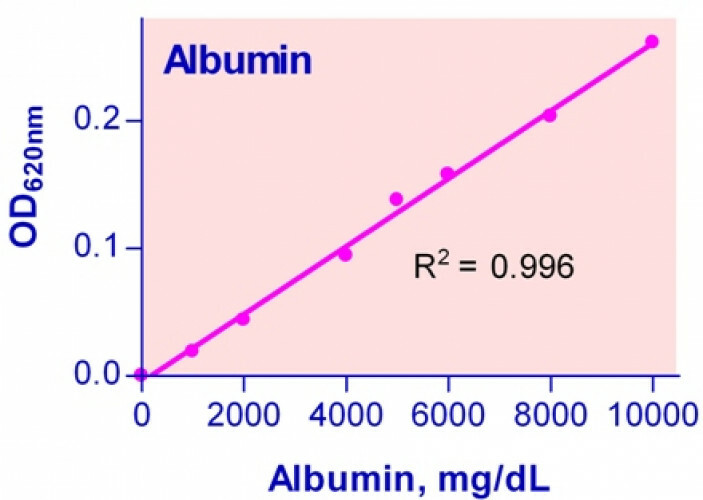 References Assay: Albumin in Mouse urine, serum (Pubmed).